Do you have a clear idea about how to restore lost data due to deletion, virus attack or Android update? Here is a Best Android Data Recovery App Recommendation for you. Due to the open source of Android system, it is vulnerable to virus attacks or requires frequent system upgrades. In addition, users can sometimes mistakenly delete data of android phone. No matter how cautious we are, such situations do happen on our Android phone from time to time. Do you have a clear idea about how to restore lost data due to deletion, virus attack or Android update? Actually, the lost files haven’t been deleted. They are just technically marked for deletion and invisible to us. To find those invisible files, you have to take Best Android Data Recovery App to complete the job. Has friendly user experience and wizard operation, you can recover the data by only three steps and easily find the lost data. It can recover the lost data of android devices, including photos, videos, contacts, mes-sages, notes, call logs, bookmarks, reminders and calendar, etc. Support data recovery from extension SD card of the mobile phones. Support files preview, such as JPG, GIF, PNG, MP3, MP4 and other files. Let's take a look at how to recover data with this Best Android Data Recovery App Recommendation. First, you should root your Android device. Root means get the highest privileges on your Android device. Every brand of Android data recovery software requires root your android phone before the recover. And so does Bitwar Android Data Recovery. Without root access, the program can't fully scan all the files on the phone, which causes the recovery process uncompleted. There is an app called, Kingroot which roots the Android devices in just a matter of seconds. For information on how to root, refer to How to Root your phone. Second, recover lost data from android phone. When you try multiple times, it is likely that root will be succeeded. but for some reasons, if rooting fails,again and again, Please change another root tool and root again. After root, there’s a “Analyze Device” window pops up before you go next with contants recovery. Select contants, the application starts to search the deleted contants on your phone. And you can see the data are appearing on the window. Select what you need and click “Recover”. 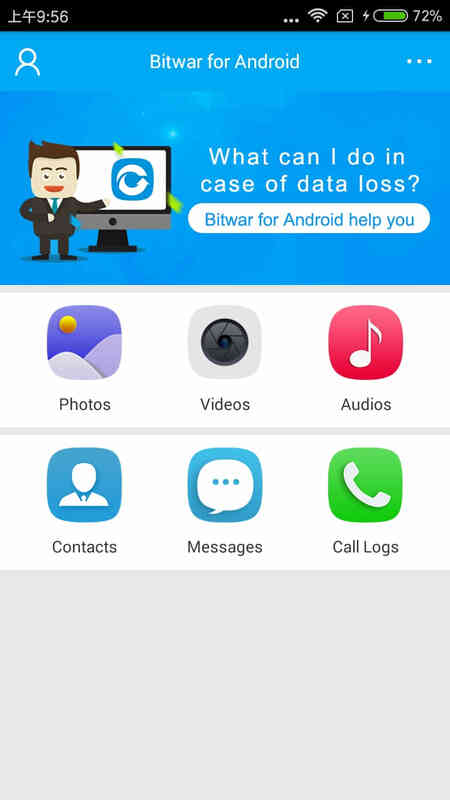 If you want to restore your deleted Android data on your computer, you can try to apply Bitwar Android Data Recovery PC version to get your jobs done. The advantage of recovery on windows is that you can save the recovered data on your computer, and it also reduces the possibility of data being overwritten. Want to recover data on a computer, refer to How to Recover Deleted Photos From Android Internal Storage? Summary：Videos can record important moments in our lives, so we often use smartphones to take videos at any time, however data loss might happen to everyone. Does anyone know how to recover deleted videos on Android phone internal memory or without computer?